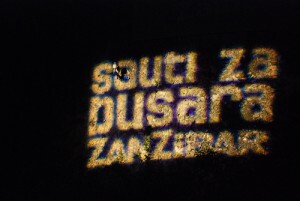 Sauti za Busara (which translates from Swahili as ‘Sounds of Wisdom’) is an annual music festival taking place on the island of Zanzibar. Its incredibly scenic location (a 12th century Omani fort which is a World Heritage site), impressive curriculum of musical alumni, good-spirited revelers and overall accessibility have earned the event a reputation as “the friendliest festival on the planet”. This year marked Busara’s tenth-anniversary, and an impressive procession of both local and Pan-African acts made for a memorable birthday party. I was lucky enough to attend this sonic super fiesta for the second year in a row and, like in 2012, thoroughly enjoyed the tidal wave of top-notch live music. Live indeed, because the tag line of this year’s festival was 100% Live – Full Mzuka!*. No playbacks, but real, loud, face-melting sonic havoc. I recommend you all check the Sauti za Busara website for more info on all performers, but here’s my personal top 5 of performances which got the Old Fort wobbling. Hailing from the island of Réunion, Nathalie Natiembe is a diva with undeniable charisma. Her show, featuring a blend of jazz, reggae and rock, was a display of power and, ah well, outright ‘stage-tigerism’. Howling solo’s and heartfelt screams made the audience go wild! This year’s festival’s headline performer didn’t disappoint. Cheikh Lô, on the tip of sixty, is such a natural and multi-faceted entertainer. Dressed up in magnificent gown and displaying his leg-long rasta hair, he gave us a wonderful taste of his singing, guitar and even drumming skills. From beginning to end, Khaira Arby’s performance breathed an air of weight and importance. Hailing from Timbuktu, Mali, Khaira has been – and is – one of the prime targets of the Islamists in their quest to silence the country’s most unique artists. Boy, did she make her voice heard on that stage. True, strong, wonderful. I love it when, during a live show, artist(s) and audience are completely in sync with each other. Sousou & Maher Cissokho, with their enchanting kora interplay, managed to lift themselves and the crowd up high as if to another world. They felt the love of the audience, while the audience felt the duo’s love for each other and their love of music. A gripping display of live-show synergy. Mokoomba have it all: style, swag, charisma, creativity, and, above all, energy. They’ve been called “the most exciting Zimbabwean band in recent memory” and in the Sauti spotlights, they showed why. A spectacle of Afro-fusion song and dance which embodied the Full Mzuka* ethos; I advise you all to go buy their album! Again, these five are just my personal favourites. Many other great artists graced the festival stage, such as Atongo Zimba from Ghana, Zimbabwean poet/rapper Comrade Fatso, American-Burkinabé blend Burkina Electric and – local gems – DDC Mlimani Park Orchestra, Lumumba Theatre and Culture Musical Club. Should you have the opportunity next year, be there for Sauti za Busara 2014! *Mzuka translates from Swahili as ‘(a)live’, ‘wild’, ‘real’.